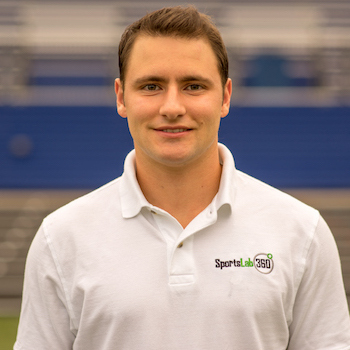 SportsLab360 was founded in 2016 by Nick Manzoni and Thomas Poll. A recipient of seed funding from the Lorentzen Hatchery Program, we conceived and developed the program right from our college dorm room. Since then, we have experienced continued growth towards our mission through the support of additional entrepreneurial grants. At SportsLab360, we wholeheartedly believe that a player should develop physically, technically, and psychologically. We also believe that the mental--specifically the soccer IQ--component of a player's development is of equal importance. We spent some time searching the web, the soccer community, and other channels to see if we could find a program that specifically targeted tactical development, and we came up empty-handed; so, we took it upon ourselves to create an accessible, practical, organized, and easy to-use program focused entirely on tactical development. At the age of 17, Nick was diagnosed with a rare form of cancer that put his life and his future soccer career in the balance. After nine months of treatment and three surgeries, he was able to recover what was lost and eventually played four years at the Division 1 level. Because physical activity was not possible during his treatment, he found other ways to continue to develop as a player; he became a student of the game, taking any opportunity he had to further his tactical education and understanding. It was from this experience that the SportsLab360 mission took shape. As a player, Nick grew up playing for various clubs around the Midwest, eventually landing at Minnesota Thunder Academy. From there, Nick went on to play in the Missouri Valley Conference for the Drake Bulldogs, after which he "retired" from the game. Upon graduation, he worked for U.S. Soccer as an Associate for the Sporting Development arm of the company and took an active role in analyzing the youth soccer landscape with an emphasis on player development. Nick has over a decade of youth coaching experience, having coached at the Under-5 level all the way up to the Under-18 level.